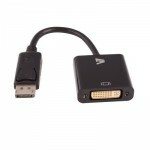 The V7 Displayport to DVI Adapter lets you connect your PC or tablets with a DisplayPort to a high definition monitor, projector, or TV that uses a DVI connector. View Full HD video, and display resolutions up to 1920x1200. Supports transfer rates up to 1.65 Gbps. Supports High-bandwidth Digital Content Protection (HDCP) on HDCP compliant VGA displays.